This is the forty-third in a series of posts that report on the state of the parties as measured by opinion polls. By pooling together all the available polling evidence we can reduce the impact of the random variation each individual survey inevitably produces. Most of the short term advances and setbacks in party polling fortunes are nothing more than random noise; the underlying trends – in which we are interested and which best assess the parties’ standings – are relatively stable and little influenced by day-to-day events. If there can ever be a definitive assessment of the parties’ standings, this is it. Further details of the method we use to build our estimates of public opinion can be found here. After the storm, the calm. Last month we found one of the largest shifts in opinion we have recorded since 2010, as Labour support plunged nearly three points in a few weeks. This month things have been more settled. Labour have recovered slightly, rising 0.6 points to 32.2%. 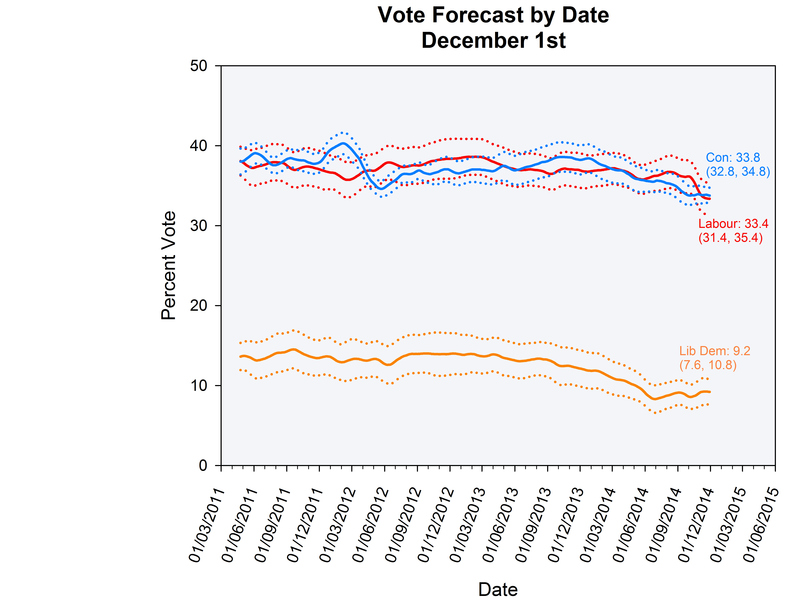 The Conservatives fell back a little in November, down 0.7 points to 30.0%. As a result, Labour’s lead, which had fallen to less than one percentage point at the end of October, has recovered to a still anaemic 2.2% as the Christmas break approaches. Labour will take solace from the fact that their autumn slump has halted, and that the Conservatives’ three year failure to recruit new support has continued for yet another month. The party seems never to have recovered from the damage done to its reputation by the omnishambles budget in the spring of 2012. 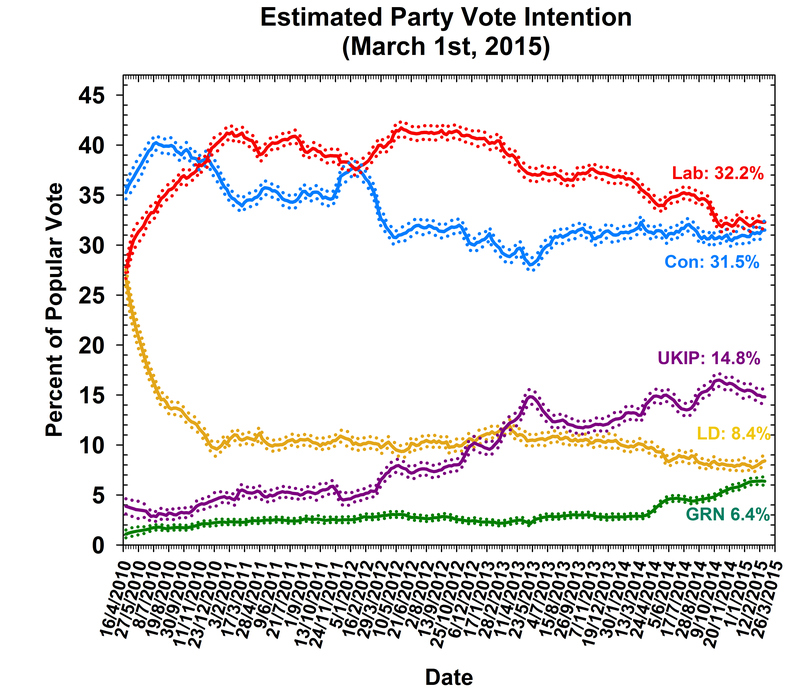 However, a lead of two points remains awfully precarious, and as we saw in October all that Cameron’s party need is one strong month to pull ahead in the polls. Both parties will go into their Christmas break with reasons to hope, and plenty to worry about. UKIP had another strong month in November, with Mark Reckless, their second defection from the Conservatives, comfortably elected in UKIP colours in a seat without a demographic pro-UKIP lean. The sustained upward trend in UKIP support continues for another month, as Farage’s insurgents rise to 16.2%, a new record, up one point on last month. The pollsters have now arrived at a clearer consensus on UKIP support, reflected in the narrower “confidence interval” in our estimate, shown by the dashed lines. Farage and his colleagues will certainly be among the nation’s most confident politicians going into Christmas break. A year ago, many doubted that the party could convert their rising support into Westminster seats. No longer. Now the questions under heated discussion at political Christmas parties will be: “how many seats? Where? From whom?” The party can take great pride in its achievements to date, but longer term challenges remain. Even if it were to win 10 seats, the top end of most expectations, that would see 15% of the vote converted to less than 2% of the elected parliamentary intake. 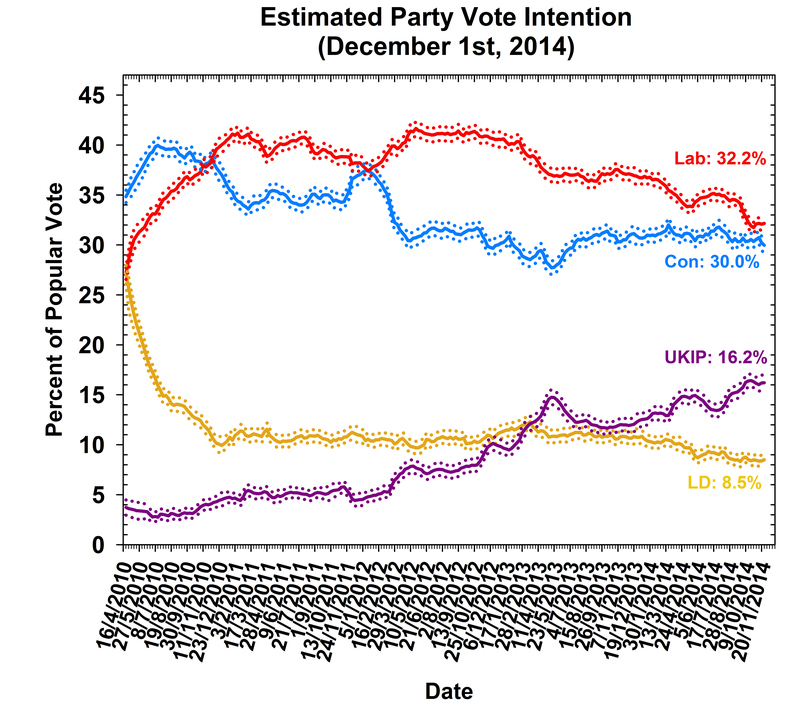 The national polling provides little Christmas cheer for the Lib Dems. We have them at 8.5% this month, the same as last month. Their struggles to hold off the challenge for fourth place from the Greens continue, though as yet we do not have an estimate of Green support. The main source of solace for Clegg’s party comes from the Ashcroft constituency polling, which shows many Lib Dem incumbents in a much stronger position than national polling suggests, although Clegg himself seems to be struggling to hold off a Labour challenge in his Sheffield Hallam seat. 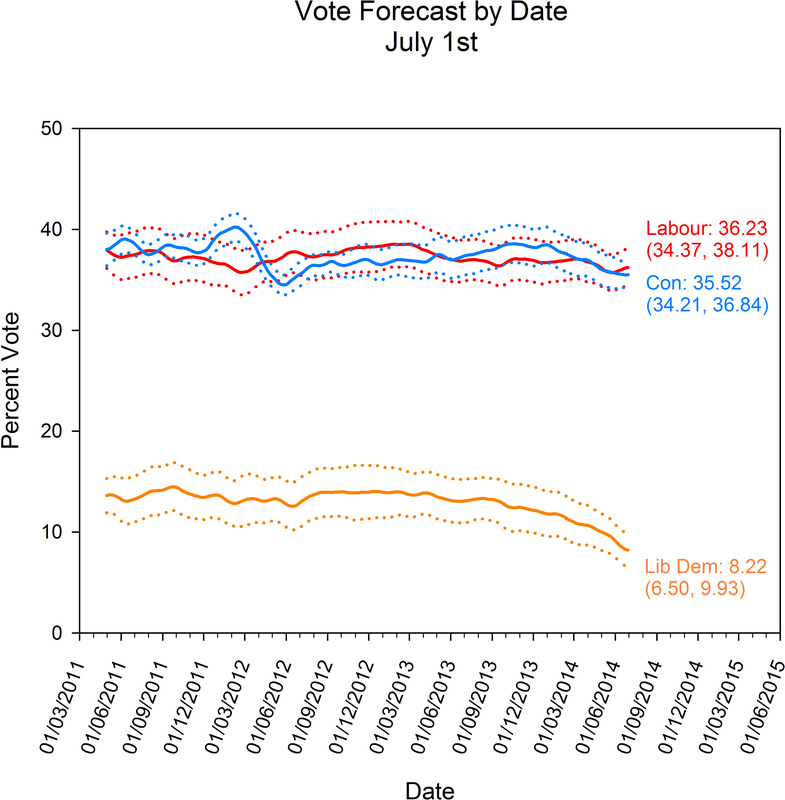 This month we can also bring you an update on our national polling forecast figure. We didn’t publish a forecast last month, so the changes reported are on the figures from two months ago. Labour’s decline in the polls over that period also is reflected in our forecast, though we do anticipate some recovery from the current level. We forecast a share of 33.4% for Labour next May, representing a fall of 2.8 points over the past two months. The Conservatives’ forecast share has not risen, however – we have them winning 33.8%, up just 0.1% from October’s forecast. 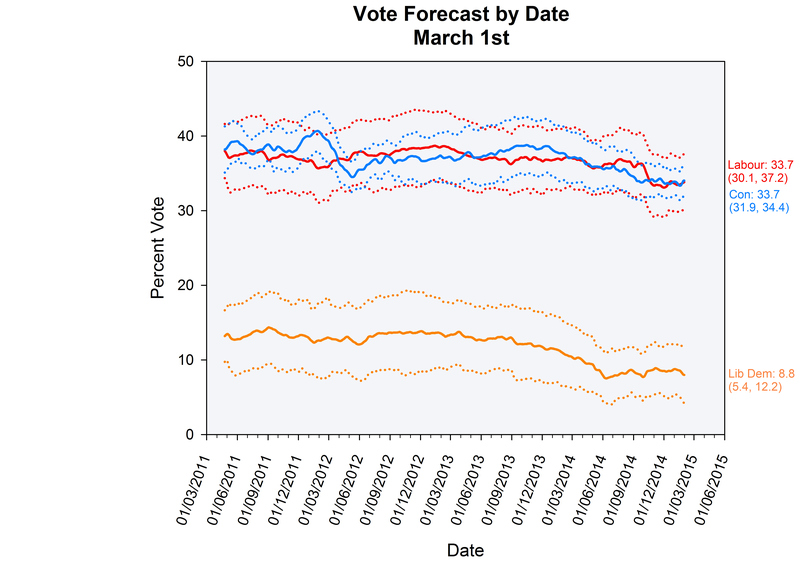 The Liberal Democrats are also expected to recover somewhat based on historical trends in the polls. Our current forecast is for 9.2%, up 0.5% on the previous estimate. 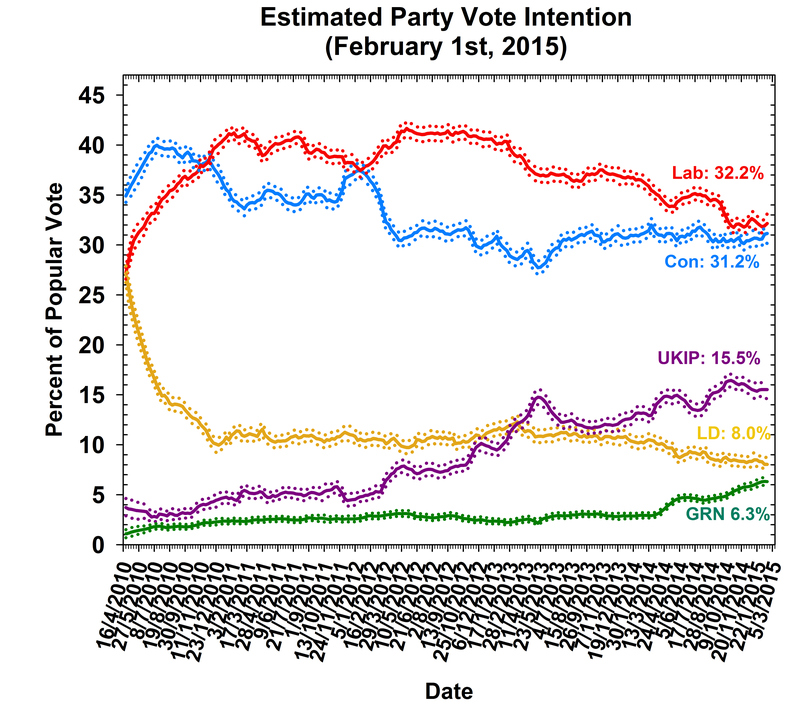 As before, we do not make a direct forecast of UKIP support as our forecasting method is based on historical polling trends, and there is not sufficient data to apply this method to UKIP support. The current polling and the forecast both point to a near dead-heat between the top two parties. Yet neither may be particularly reliable anymore as an indicator of how the next Parliament will look. British politics has never been more fragmented, and that fragmentation means geography and constituency context could be decisive. Surging support for the SNP, UKIP and the Greens is impossible to understand without focussing on the constituency battles where these parties will look to convert votes into seats, while the fate of the Liberal Democrats will turn on whether their legendary local campaigning skills can still deliver in a Siberian climate for the national party. We will shortly unveil our seat-level forecasting model, which attempts to capture some of this variation from seat to seat and produce a more accurate assessment of how the fragmented national political competition will play out in the hundreds of local contests which will decide next year’s outcome. In the meantime, we will continue to keep our usual close watch on the polls, as the closest political contest in a generation enters its final stages.